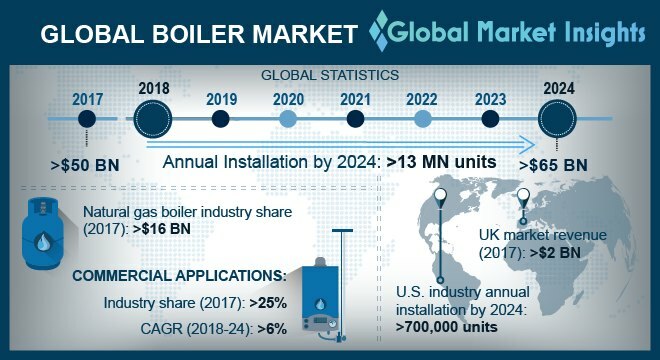 Boiler Market size will surpass USD 65 Billion by 2024, as reported in the latest study by Global Market Insights, Inc. Sizeable investments toward the upgradation & expansion of existing commercial facilities along with rapid industrialization across emerging economies will stimulate the global boiler market size. For instance, in 2017, Singapore based CAPITALAND established its private equity fund worth USD 300 Million in order to boost commercial property expansion in Vietnam. In addition, shifting trends toward energy efficient heating solutions on account of rising concerns over GHG emissions will further accelerate the product deployment. The U.S. market is set to exceed an annual installation of 700 thousand units by 2024. Ongoing investment activities across industrial & commercial sector along with rising focus toward replacement of existing steam generating units will fuel the product demand. Positive outlook toward primary metal manufacturing & chemical industry will further augment the business growth. Rising demand for electricity on account of rapid industrialization is set to propel the global market growth. Emerging economies across Africa & Asia Pacific regions have established massive investment plans for increasing the capacity of existing power generating facilities, this in turn will positively impact the product penetration. For instance, NTPC plans to generate additional 20,976 MW power in next seven years. Commercial boiler market will expand over 6% by 2024.The ability of these boilers to offer reduced breakdown risk, better air quality, high efficiency and automation options as compared to conventional furnaces, will increase their adoption across the industry landscape. Seasonal demand for steam and hot water from hot and temperate climatic zones will further propel the business growth. Legislative directives promoting the use of clean fuel along with stringent emission norms will drive the natural gas fired boiler market size. For instance, in December 2015, over 140 countries, under the Paris Climate Change Agreement pledged to reduce their greenhouse gas emissions. The EU pledged to reduce its domestic carbon emissions by 40% from 1990 levels by 2030. The UK market in 2017, was valued over USD 2 billion. Improved gas infrastructure coupled with ongoing technological advancements will drive the industry growth. According to a government agency, USD 282 billion will be invested by 2020/21 in the expansion of the country’s pipeline infrastructure. 100-250 MMBtu/hr boiler market is set to grow over 4% by 2024. Ongoing investments toward the expansion of heavy industries & refinery along with increasing applications of these boilers across utilities will positively influence the business landscape. For instance, Total & Saudi Aramco, in 2018, signed an MOU to build a petrochemical complex in Jubail, Saudi Arabia. Positive outlook toward healthcare industry coupled with rising demand for replacement of conventional heating units will drive global commercial boiler market size. Technological advancement, government subsidies and improved infrastructure of gas pipeline network will further boost the product adoption. For instance, according to the International Energy Agency (EIA), Iran has offered subsidy of over USD 13 billion on Natural Gas. Key participants operating across the global market comprise General Electric, Cochran, Parker, Thermax, Weil-McLain, Babcock & Wilcox, Bharat Heavy Electricals, Fulton, Forbes Marshall, A.O. Smith, Hurst Boiler & Welding Co., Burnham, Cleaver-Brooks and others.